I was cleaning out my old photos that have collected over the years, and I came across some pictures I took of Pink Noises when Professor Gurevich assigned us our final essay in PAT101. 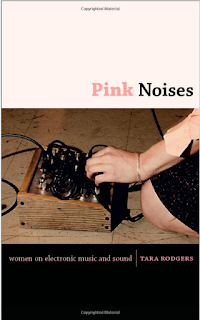 I think many of us used Pink Noises as a reliable source when gathering information regarding gender and electronic music. From the few screenshots I took of the book, I was surprised by how many of the interviewed artists were DJ's. According to the full book's bio online, women involved in the club/techno scene were also interviewed. I haven't had the chance to verify this myself yet, but I definitely plan to! I'm glad this book is coming up again and connecting to the other stuff we're getting in to lately because this book is PACKED with talented artists' interviews. Now I have a good excuse to check it out again! I could not think of a better thing to be played with the light controllers than "Spastik"
Jlin : Chicago Juke Newcomer's "Nandi"
First of all: today was great and I have so much fun discovering new musical ideas with all of you. Second: Spring is coming and this track reminds me of spring. Lastly: I really like how Peter was talking about how we should all listen to some funk this next week. I felt it appropriate to also share this track because I feel like it has some great representations of what we should aim for rhythmically in Gold Afrofunk Martian. Ps. I can TOTALLY see us yelling something like, "make it funky" in the piece. It's so fun! This guy is pretty inspirational. Especially his hat. In all seriousness, it might be a cool compositional idea to have some sort of lead instrument with a tempo synced delay like this. Here's the progression with the correct chords... I muted the leads I had in mind to open up some room for your ideas! The arpeggio thing could be cool if someone can make it better than what I have lol. Thanks! While preparing a project for PAT 462 I spent some time in Ableton drafting a bit of techno to play in ChucK. Maybe we can use it as a new track; maybe just play it during piece intermissions or via ChucK. Either way, feel free to take a listen. Ian Gold (former member of ECM) and I were watching this video over the weekend and it got me thinking about our group. MasterDJProfess. GuruGurv mentioned yesterday his hope for the ensemble to get to the level where we maneuver transitions, phrase durations/shaping, and the general performance without someone directing. I feel this video captures that sense of collective understanding among a big group of musicians quite well. I don't really expect people to watch this entire video (although YOU SHOULD, THIS JOINT IS INCREDIBLE), BUT I WOULD ASK.......LET ME TURN OFF CAPS LOCK...that peeps would watch the first few minutes and these specific time points to get a sense of the deep connection evident in this group-- to the point where, with seven musicians, the overall sound isn't too cluttered, and they all transition together without anyone saying anything. This is demonstrated perfectly at 8:00 where Miles plays a descending line and the rest of the band brings the energy way down with him. Another incredible example is when at 11:45, the band is in this free section, then Chick Corea (on keys) out of nowhere plays the opening chords of the next song and everyone else immediately catches on, hitting the next note with him. That level of mental intimacy is scary. Also, note the dialogue between Miles and the drummer, Jack DeJohnette, at 9:45. That's the kind of dialogue I'm thinking of when, in the piece I brought in, there are a couple people playing over each section and each person is essentially soloing and feeding off each other's ideas. Sorry for the long winded post. Thanks to those who made it this far. Just have a lot of thoughts on these notions. Especially given how many people are in the group, listening becomes all the more crucial to our sense of trajectory and the impact of our musical statements. P.S. I just want to note....................how cool they look. I put together a little LPC Speech-ifier in Max, based on Mark Cartwright's LPC Toolkit. Muzik Nonstop. Maybe we could make a piece where one of these voices says a bunch of whack stuff. Either way, play around with this because it's super fun and has a visual element too!!! Electroluminescent wires pulse to the beat. Audio signal from the laptop microphone is filtered and thresholded to light up when a certain band of the frequency spectrum has high energy. Next step: develop the interaction with photocell for a compelling, audience driven musical result. I came across A.Mochi while listening to some of Shin Nishimura's tracks. I really respect how he uses repetition in a natural sounding way. I do not personally believe his work is ridiculously incredible by any means, but he takes his time time when showcasing individual sections. He never rushes between ideas and lets them sit comfortably for as long as he thinks they should. As a class, this is a challenge we often face-- letting our ideas sit long enough for a listener to digest. His melodies are, overall, not as complex as ours, and the amount of instrumentation he uses is also lower than us, yet he still lets sections repeat for long amounts of time. Although this repetitive element is a natural key to the minimalist techno genre, confidence also comes into play. If we are not confident with our track, we will not have the courage to play our melody that's a minute and a half long. I think we have recently been doing a good job at this, but for future tracks we should continue to remind ourselves of our confidence and rock for as long as we think we should! I like how this track gets groovy and then gets spacy, yknow what I mean? Alongside the cultural developments that provided an impetus for Detroit techno was the evolution of music technology, including the legendary DX7 synthesizer which found its way into just about everyone's music in the 1980's--Michael Jackson, Juan Atkins, Queen. Given the importance of the technology, I had a hunch that someone would try to emulate the sounds and interface of the DX7 into a VST. Turns out that not only does it exist, but it's free and sounds excellent! The VST is an open-source plug-in called Dexed, and is pretty fun to mess around with and create new sounds. For anyone interested in a more intuitive understanding on how to operate the DX7 and the plug-in, Chowning's FM Theory and Applications provides a host of example patches for the DX7 in a manner that systematically explores FM synthesis. I've found that translating Chowning's intended DX7 patches into Dexed parameters is fairly straightforward. Here's a start of a track I've been working on... I'd really like to expand and play it with all you guys, so any feedback would be great! Professor Gurevich suggested that I look into making a talk box, so I've been doing some research on how I might go about doing this. It turns out it's pretty simple, and all you need is a compression driver or old speaker, a plastic tube, and something to connect the tube to the driver. This guy's video is pretty comprehensive and his talkbox sounds pretty good, so I'll probably use his method. Everyone using Live should update as soon as possible. We can start using Link! So I don't know if you guys know Infected Mushroom or not, but they're an AWESOME Israeli psytrance/electronica duo formed in Haifa in 1996. They've said a lot of their inspiration comes from 80's techno. Although their music sounds a little different from what we're writing, the sounds they get are incredible and they have some really cool melodies I easily catch on to. You can tell a lot of thought went into composing their tracks. Here's a link to one of my favorite albums of theirs. So I was thinking on our trials towards writing lyrics for our tracks and I started to think about one of my favorite records, Since I Left You by The Avalanches. This record is produced almost entirely out of samples, and for many of the tracks to have lyrics, The Avalanches used various vocal samples to form various quirky sentences, which remind me of our "Silver Apples of the Moon" track. Anyways, I was hoping to distribute this as inspiration for these lyrics, and possibly an idea of a future track of ours with sample based vocal lyrics. Anyways, this beat isn't exactly techno, but it's also not that far off in a lot of ways! And if you have time, you should definitely check out the rest of this record. I know earlier this week we were talking about my being added to the vocal processing squad. This is my inspiration for vocal processing that I would like to bring into our techno realm. Arca's also one of my favorite producers (aside Dimlite). If you're looking for some insane sound design to chew on, bite his latest record Mutant. Among the many things that the lab section is working on to augment our performance with novel instruments and compositional mediums is a project involving the conversion of our classroom into a suitable Ambisonic environment. 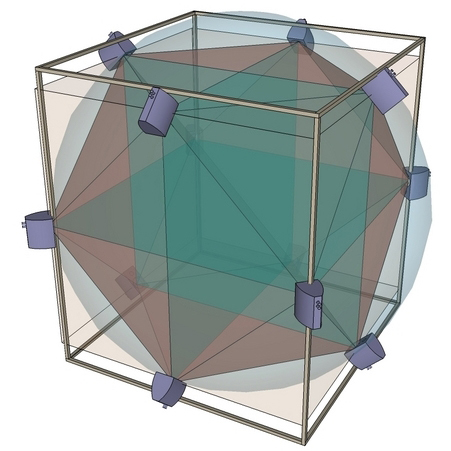 Ambisonics--meaning "surround sound"--is a step beyond the typical 5.1 surround configurations that we've been exposed to, and ultimately masks the location of the speakers, allowing the sound to exist in a parameterized position in three-dimensional space. It also requires a crap-ton of speakers. What will this technology mean for our performance? At a minimum, it will allow us to use the space that we play in as a compositional medium in itself by prescribing sonic elements motion and location on the surface of a hemisphere surrounding the audience. If realistic distance cues can be created, we may even be able to use the entire space of the audience. The project will take time to implement, but in the mean time I challenge everyone to think about a new compositional consideration: where in space does my sound fit? Is it bouncing around exuberantly? Descending around the audience? Gently hovering above them? Similar to how animation techniques can give a character personality, this extra dimension can shape how a sound is perceived--including its emotional context. Of course, being able to use this spatialization technology does not mean we should use it for every song or every part, so just as with our choice of timbre and layering we will have to exercise our judgment in using this new tool. There are still queer spaces for techno. Of those I know - Honcho's Hot Mass in Pittsburgh, this recent development serves as a queer space for many. This article is very thorough and also gives you the sense of the international scene too. THE CLUB ABOVE. Main St.
Our Very own Jeff Garcia is DJ-ing. In Triplicate from Matt Romein on Vimeo. I found this incredible video piece yesterday. It seems pretty techno to me. Not sure if something like this is worth considering for our show, but I could definitely see something like this going well with beats! Today Sir Everett Reid showed the folks in Digital Sound Synthesis some music by Dimlite. I was inspired to listen to more music by this sound design genius and came upon this track. The vocoder is awesome. I hear pitch modulation and I think there's some layering and some other stuff going on. He could just be doing the pitch mod with his pitch wheel, but I'd like to find a way to automate this effect using vibrato or something. My goal is to try to figure it out and use it for a piece in class.